Just a short boat ride away from downtown Halifax, McNabs Island is one of the city’s best kept secrets and one of Nova Scotia’s most unique parks. Few tourists venture out to the island, in the mouth of Halifax harbour, but those who do are rewarded with deserted beaches, old forts to explore, a lighthouse to admire and tranquil walking trails. The park was first settled in the 1780s but today just a few cottages remain. Hangman’s Beach is among the more gruesome of its features. It was used by the British to hang deserters, with the bodies left on the beach as a warning to sailors not to run away. At just 5km from end to end, the island is easily explored on foot. Come for a day or set up a tent and stay the night. Camping is free but you must get permission first by calling the government department in charge of the park at 1-902-861-2560. Remember to bring drinking water and food because there are no services on the island. Bathroom facilities are in the form of pit toilets. To get there, you’ll have to charter a boat. It’s cheaper than you might think – from just $12 return. McNabs Island Ferry service is one operator to contact. 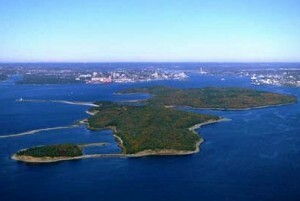 Learn more about the features of the island on the Friends of McNabs Island website.